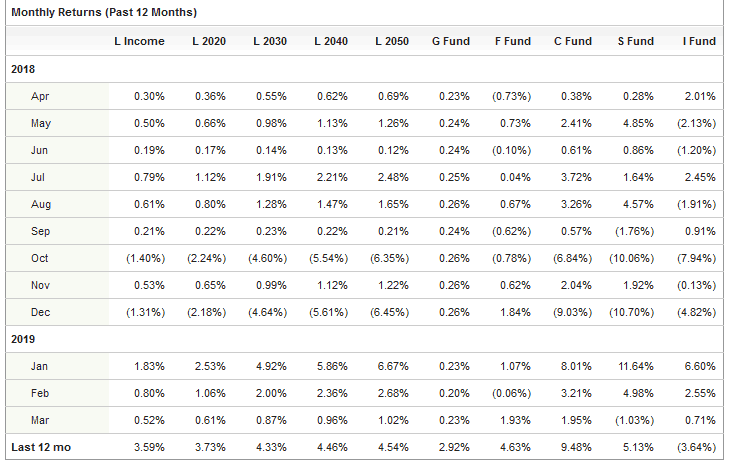 Below are the latest TSP returns of the G, F, C, S, I and L investment funds as calculated by the Thrift Savings Plan. A description of each of the TSP funds here. Percentages in ( ) are negative. The G Fund is invested in short-term U.S. Treasury securities. It gives you the opportunity to earn rates of interest similar to those of long-term Government securities with no risk of loss of principal. Payment of principal and interest is guaranteed by the U.S. Government. The interest rate paid by the G Fund securities is calculated monthly, based on the market yields of all U.S. Treasury securities with 4 or more years to maturity. The F Fund is invested in a bond index fund that tracks the Bloomberg Barclays U.S. Aggregate Bond Index. This is a broad index representing the U.S. Government, mortgage-backed, corporate, and foreign government sectors of the U.S. bond market. This fund offers you the opportunity to earn rates of return that exceed money market fund rates over the long term (particularly during periods of declining interest rates). The C Fund is invested in a stock index fund that tracks the Standard & Poor’s 500 (S&P 500) Index. This is a broad market index made up of the stocks of 500 large to medium-sized U.S. companies. It offers you the potential to earn the higher investment returns associated with equity investments. The S Fund is invested in a stock index fund that tracks the Dow Jones U.S. Completion Total Stock Market (TSM) Index. This is a market index of small and medium-sized U.S. companies that are not included in the S&P 500 Index. It offers you the opportunity to earn potentially higher investment returns that are associated with “small cap” investments. The S Fund has greater volatility than the C Fund. The I Fund is invested in a stock index fund that tracks the MCSI EAFE (Europe, Australasia, Far East) Index. This is a broad international market index, made up of primarily large companies in 22 developed countries. It gives you the opportunity to invest in international stock markets and to gain a global equity exposure in your portfolio. What are the L Funds? The L Funds, or “Lifecycle” funds, use professionally determined investment mixes that are tailored to meet investment objectives based on various time horizons. The objective is to strike an optimal balance between the expected risk and return associated with each fund. The L Funds’ strategy is to invest in an appropriate mix of the G, F, C, S, and I Funds for a particular time horizon, or target retirement date. 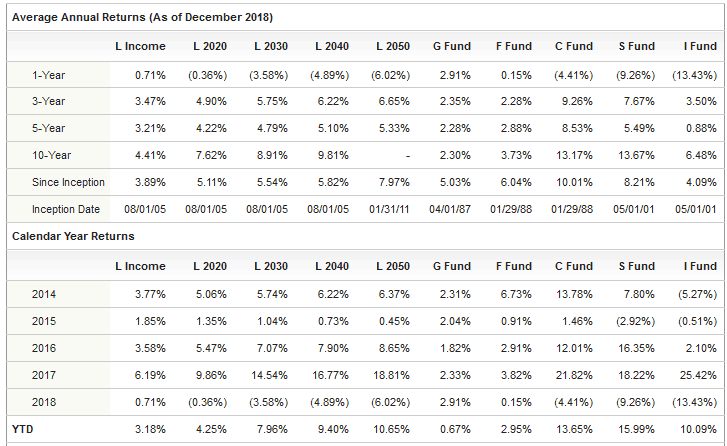 The investment mix of each L Fund becomes more conservative as its target date approaches.